It’s a mid-size supersport that holds its own against a superbike. 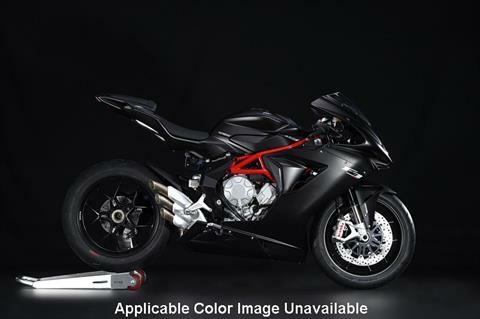 It combines the agility of a supersport with the acceleration of a superbike. ADVANCED ElECTRONICS: The F3 800 features the latest evolution of the MVICS system with multi-map Full Ride by Wire, 8-level traction control and EAS 2.0 up & down electronic gearbox mated to a hydraulic slipper clutch. The electronic injection system has two injectors per cylinder with record 50 mm diameter throttle bodies. LONGER STROKE: Bore on the F3 800 is the same 79.0 mm, but the stroke increases from 45,9 mm (effective cubic capacity of 675cc) to 54,3 mm (effective cubic capacity of 798 cc), with the rev limiter intervening at 13.500 rpm. Higher-flow fuel injectors compared to the F3 675 ensure additional power, whilst it features the same counter-rotating crankshaft. MORE POWEER, MORE TORQUE: Thanks to the increased stroke of the crankshaft, the F3 800 delivers 148 hp at 13.000 rpm (+20hp with respect to F3 675), together with a maximum torque of 88 Nm at 10.600 hp. More power, more torque (+17Nm), more adrenaline! THE BEST PARTNER FOR YOUR SAFETY: When all you have to think about is riding, fun and pleasure are at their top, especially since safety is ensured by the two-channel Bosch 9 PLUS ABS system with Race Mode. With Rear Wheel Lift-up Mitigation, the system controls the pressure applied on the front brake to avoid involuntary rear wheel lift-up. NO FEAR: The F3 800 is not afraid of taking on the heavy hitters, thanks to its extraordinary handling, its advanced electronics and its new 148 hp 800 engine with 88 Nm torque. Its weight is an amazing 173 kg, another MV record. LIGHTWEIGHT, AGILE, ESSENTIAL: The F3 800 defines a new paradigm in motorcycling. The road opens up as the speed increases. The bike almost becomes immaterial and creates a direct connection between rider and tarmac. TRACTION AND AGILITY: It’s pure sensation, instinct, adrenaline. Everything is possible.